Learning about autistic children and visual cues can help parents figure out ways to communicate with their children. Many children with autism respond better to visual prompts than they do to verbal instruction at home and in classrooms. Find out more about how children with autism respond to visual cues and how to use available visual supports to help your child. Children with autism often have significant communication, speech and language difficulties that can make home life, social activities and school challenging. The severity of communication problems vary because autism is a spectrum disorder. However, the use of visual aids can help autistic children of all levels of impairment better understand their environment, daily life activities and learning academic ideas. 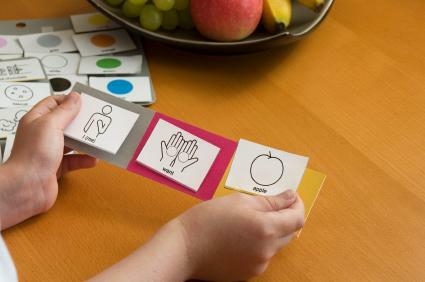 Visual communication systems can also provide a voice for nonverbal autistic children. It is not known why children with autism learn and communicate better visually. One theory is that people with autism experience time perception differently than nonautistic people. According to autism expert J.G.T. van Dalen, a child with autism might have delayed responses to verbal instruction and questions because it takes him longer to hear the words, process their meaning and come up with an appropriate answer. Another theory suggests that there may be impairments in the area of the brain that processes language and speech. Studies have pointed to possible differences in brain growth, function or structure in some people with autism. Picture Exchange Communication System (PECS): PECS is a picture card language program that can be used in place of speech. Illustrated language boards: Picture boards can help build language skills. Sign language: Signed Exact English or the American Sign Language systems can augment speech because some nonverbal children with autism respond well to the hand gestures. Conversation cue cards: Conversation cards use pictures to provide social cues and sometimes a script that encourage appropriate verbal speech. Picture flash cards: Many picture cards to teach specific lesson plans exist. The Internet has a number of free printable picture cards for teaching autistic children. Computer programs and games: Some children with autism do extremely well playing educational computer games that provide plenty of graphic illustrations for instructions and lessons. ZAC browser, an Internet browsing system designed specifically to help people with autism navigate the Web has many games and activities with visuals. Children Succeed also provides educational games for autistic children with many helpful pictures. Using visual aids at home for daily activities and lessons will help improve your child's communication skills. Picture cards are an easy way to find creative ways to talk with your child. Talk to your child's therapists and teachers for advice on how to use visual cues to help your child. Make the visual supports a regular part of your child's daily routine because repetition is important. Praise your child for paying attention and for correct responses. There may be days when your child does not want to participate, but rest assured that your perseverance will produce some degree of progress over time.